Reads All Common Standard Barcodes. Including GS1, Code 128, Code 39, EAN, ITF. With USB Cable (USB C Also Available). Includes Cable. Stand Or Holder Available. Thousands Sold. Now With New And Improved Optics. Reads All Sizes Of Barcodes From Tiny Up To Huge. Robust With No Moving Parts. 60 - 160mm Scan Width. Short And Long Range. "Simply plug the Phoenix in and start scanning barcodes. Our Mac OSX barcode scanners really are that easy to setup and use. Accurate - Instant - Barcode Scanning For Mac. 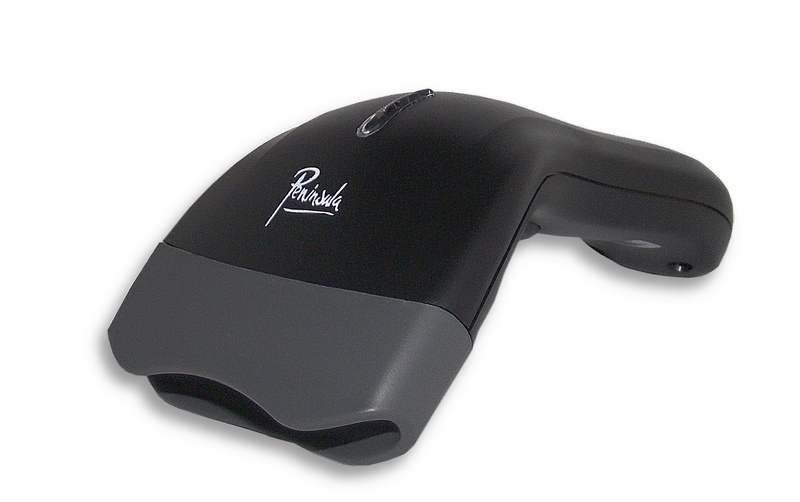 The Peninsula Phoenix IV barcode scanner allows you to read barcodes directly into any Mac application with no extra software required. everything is built into the scanner itself. Available in black with either standard USB cable or USB C cabling. The Phoenix barcode scanner is easy to set up, simply plug in and start scanning, can read all common 1D barcode types, ie GS1 13, EAN13, GS1 128, UPC, Code39, Code 128 and many others including specialist codes such as Code 32, Telepen and Laetus. Allows you to read courier barcodes and other longer codes not just codes on retail items, like other low cost scanners. Works with ALL Mac computers simply by plugging in the USB cable. ""Plugged it in. Started scanning my shipping barcodes. Brilliant!!!"" Comes complete, all cables for your Apple Mac are included in the box. Point and click, reads barcodes up to 160mm wide direct to the cursor position, no drivers required. For use in industrial, retail, library, shipping, healthcare and medical, office and other applications. ""Made our patient lookup so much easier."" Apple Mac OSX Computers And Laptops with USB. Award winning imaging barcode reader. No moving parts. Bright LED aiming line. No software required, scans to any application. Award winning imaging barcode scanner. No software required, scan to any application. Free QuickTrack Start enabler included. Aluminium Reader Stand with Fully Weighted Black Smooth base. We also offer a 30 day money back guarantee because we are confident our scanners will work for you having tested them over 25 years on thousands of computers. Last updated on 22nd of April 2019. © 2019 Peninsula Group.